The latest travel reports suggest a surge in tourist arrival to Kerala and Sri Lanka with the UK being the No. 1 market. 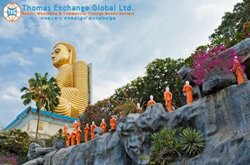 Thomas Exchange Global offers the best travel money rates to the Indian and Sri Lankan Rupee with instant availability. The popularity of the sub-continent for tourism surged last year as a record number of tourists arrived in Kerala, Sri Lanka and Maldives. The Hindu, on 29th December, reported an increase of 4.5% of tourist visits to Kerala with British being the No. 1 European market. Similarly, according to Lanka Business Online, Sri Lanka and Maldives reported 18.1% and a 10.3% increases respectively. The South Asian sub-continent is considered a very economical and popular tourist destination. However, Indian Rupees and Sri Lankan Rupees are not freely available in London at competitive prices. In addition to currencies for the sub-continent, many other Asian currencies such as the Thai Bath, Indonesian Rupiah, Vietnam Dong, Malaysian Ringgit and 100 other foreign bank notes are available for instant purchase at any of Thomas Exchange Global’s locations. As dedicated foreign exchange specialists, Thomas Exchange Global has the professional expertise, in-depth market knowledge, technological infrastructure and commitment to provide an unprecedented level of service that sets the standard in the foreign exchange industry. They are specialists in all areas of foreign exchange and provide commission-free currency as well as travellers cheques. Thomas Exchange Global also offers International Money Transfer Service where funds can be remitted to overseas bank accounts within one to two days. With commission free service for transfers over £10,000 backed by competitive exchange rates, customers are assured of a better deal and a substantial saving compared to banks and money brokers. Thomas Exchange Global branches are located at Strand, Embankment, Victoria Place (Victoria Rail Station) Victoria Street, Liverpool Street, High Street Kensington, Hammersmith, Canary Wharf, Cannon Street, Wormwood Street and Richmond.